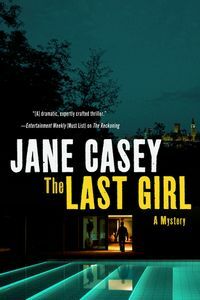 The Last Girl by Jane Casey: Synopsis and Online Purchase Options. Synopsis (from the publisher): Vast wealth offers London defense attorney Philip Kennford a lot of things: a gorgeous house with a pool in the backyard, connections in the top echelons of society, a wardrobe worthy of Milan runways. But his money doesn't provide a happy marriage, or good relationships with his twin daughters … and it does nothing to protect his family when someone brutally murders his wife and daughter in their own home. When Detective Constable Maeve Kerrigan arrives at the scene, the two survivors — Philip and his second favorite daughter, Lydia — both claim to have seen nothing, but it's clear right away that this is an unhappy family accustomed to keeping secrets. Maeve soon finds herself entangled in a case with a thousand leads that all seem to point nowhere, and it doesn't help that her boss, whom she trusts more than almost anyone, is starting to make decisions that Maeve finds questionable at best.